Well, since this report Penns has fortunately received some much needed rain (but still not enough), because prior to last weekend the stream was looking pretty anemic. But that is coming from someone who likes to fish Penns at higher levels. That said, the majority of anglers mentioned how much they love the currect conditions so I guess that is a good thing. Over the course of a few days on the water, we moved a ton of cookie-cutter 12-14" browns throughout the lower end of the kill-14" section. Up top the red brown spinner and grannom were the ticket. Underneath, a flashback #16 pheasant tail was money - fished behind a large march brown nymph. And the sulphurs have already started! Unreal!! 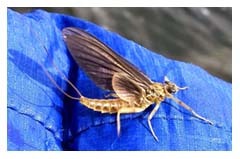 The biggest fish of the outting was a 16"er and it acted like it was afraid of the sun. Nose down, head toward the bottom! Sounds kinda dirty if you ask me!? Seriously i think Penns Creek browns are scared of the sun! I kinda appreciate that. Just my observation, but its of my opinion the average size fish on Penns in the no-kill is larger than in the kill-14" section. AND it is also my opinion there are more bigger fish in the no-kill section. What this does tell me is the kill-14" section is limiting the overall biomass of Penns. Some day I hope the PFBC does some sort of study to look into this. Lack of bugs on the Lehigh led to some slow fishing. Amazingly, we could very well be in that dead space between the early/mid-season hatches and the sulphurs. Its hard to believe that this is what we are looking at - in mid-April - but this could very well be the case. Odd start to the season. 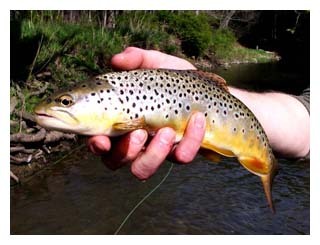 The Lehigh continues to fish well. This past weekend, despite the wind (when will it end? ), the fish were looking up at times, and underneath our maddie wet was the ticket. It appears the hatch of choice on the Lehigh currently is the caddis. It could very well be that the April Greys are done with sightings of a few grey fox over the weekend. 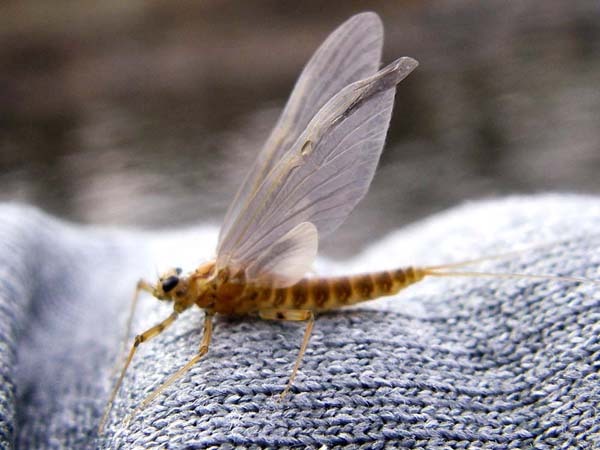 As for the caddis - there are swarms of them around the trees, and on the water there is a decent amount as well. Though there were both tan and green caddis floating about the apple green caddis was the color the trout wanted. Our cdc and green caddis pattern moved quite a few fish. It rides flush in the film. And with the fish slashing about on emergers this low riding pattern did the trick. 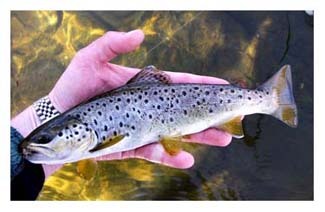 With no substantial rain in the forecast the flows should remain very stable and so should the fishing. With the water so clear and the levels at such a manageable level for the wade angler, now is the time to learn this fishery. April 1, 2012 - Opening Day - Lehigh Style! Conditions were less than desirable. Air temps were in the low-40s and the water not too much warmer than that. The plan was to focus on a stretch where we've been seeing rising fish the last couple of weeks, but upon arrival and a scan of the flat we found no bugs, and obviously no fish working. The group worked buggers, wets, nymphs under an indicator and other assorted streamers with no luck. We really worked it hard, with maybe one bump between the group. Lock jaw had set it! The water temps had really plummeted, close to 10F over the course of the week. The group decided to moved downstream a bit and work another piece of water. Again, maybe one bump between the group, utilizing similar techniques, but at about 2pm we began to notice a few quill gordons popping here and there, along with some smaller olives. Definitely a positive sign! So we moved back upstream, but still no fish on the smattering of bugs. With nothing still happening we decided to reconnoiter over a beer and a bite to eat. Time frame about 4pm or so. After the bite we fished a different side of the long run we focused on earlier and this time we were greeted to a couple of risers. There were quill gordons and olives on the water. Not a lot, but obviously enough. However, they there was a pretty good concentration on the foam line. The first riser we saw, though subtle, was mowing bugs from the surface. Head, dorsal, tail. Should have video'ed the fish for a bit. Text book rise form. A well placed 14 BWO and he ate. Solid fish, and solid fight! 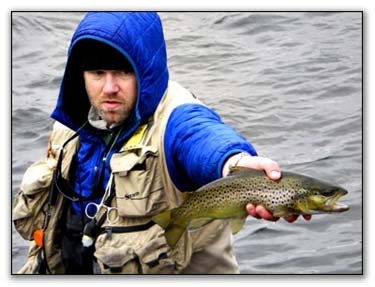 Shortly there after another anlger in the group smacked another solid brown on a quill gordon wet. It is safe to say when we do get another warm spell the river is gonna light up. I would have never thought we'd see rising fish, but they are instinctively looking up at the moment. They just want to surface feed and nothing is going to stop them. 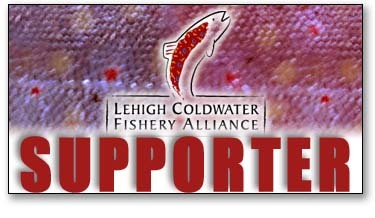 So as long as the Lehighton gage continues to border on all-time record low levels for the date, these fish are on the bugs as opposed to the usual early-season forage fish imitations.